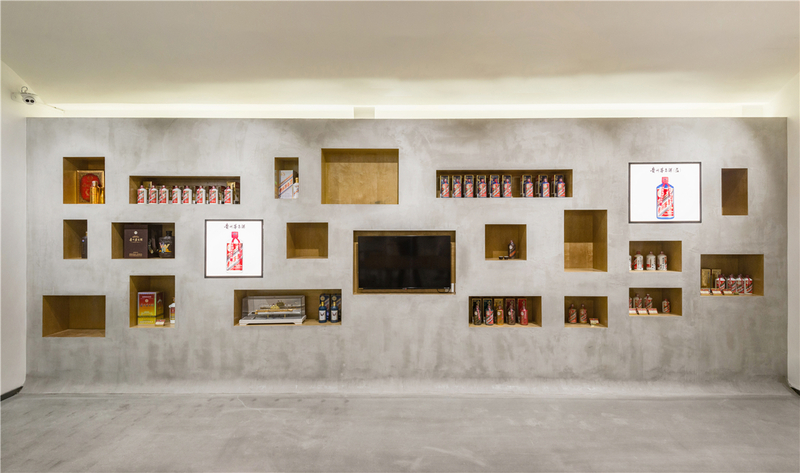 Party A wishes that multiple functions including the display and appreciation of Moutai products as well as modern propagation of the brand culture can be completed in the 90-square-meter space. 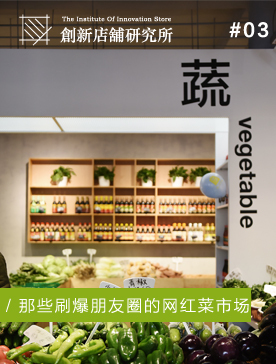 Spatial representation of traditional brands has been a direction we are interested in, propositions of multiple-functional space also poses a bigger challenge to the design, which requires new design ideas to solve problems. 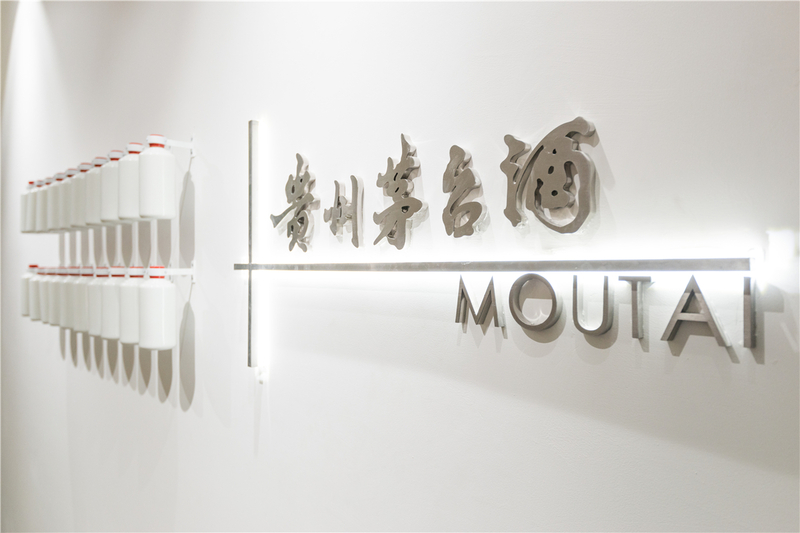 ” Moutai (spirit) ” is a representative white spirit brand of China with rich cultural deposits. 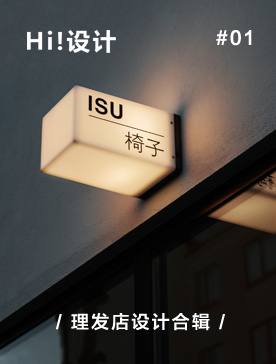 With the analysis of Moutai brand, we found that Moutai is not just a brand symbol of Chinese traditional culture, it has great influence in modern culture and even in the field of trendy culture; the results of such analysis made us more confident in interpreting this space with modern design language, and we wish to show different aspects of white spirit brands in China. 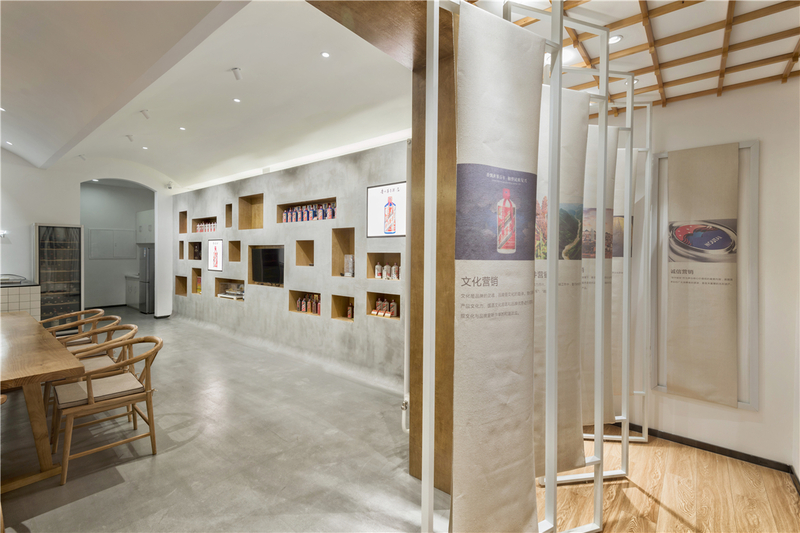 The 90-square-meter space has been divided into two spaces by the two walls, and the depth of the first sequence space at the entrance is only 1.4m, which cannot be used for white spirit display; in addition, it is rather narrow as white spirit tasting place; therefore, we have positioned this long and narrow space as “Mini Moutai brand exhibition hall”. 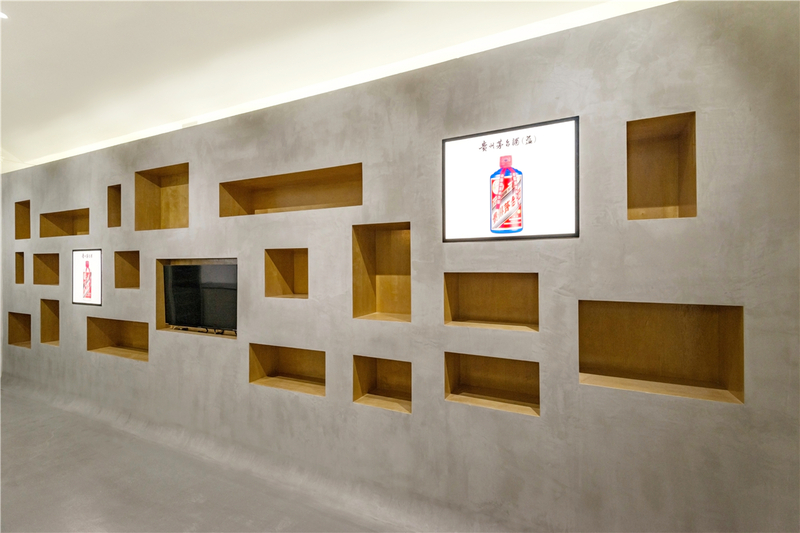 We made 10 posters of Moutai brand marketing into 10 double-sided display rack of which the width is 600mm and spread them broadwise with rotation shafts, enabling people enjoying the posters to walk freely in the narrow space. The functions of white spirit exhibition and tasting are set in the second sequence space, which is more spacious. 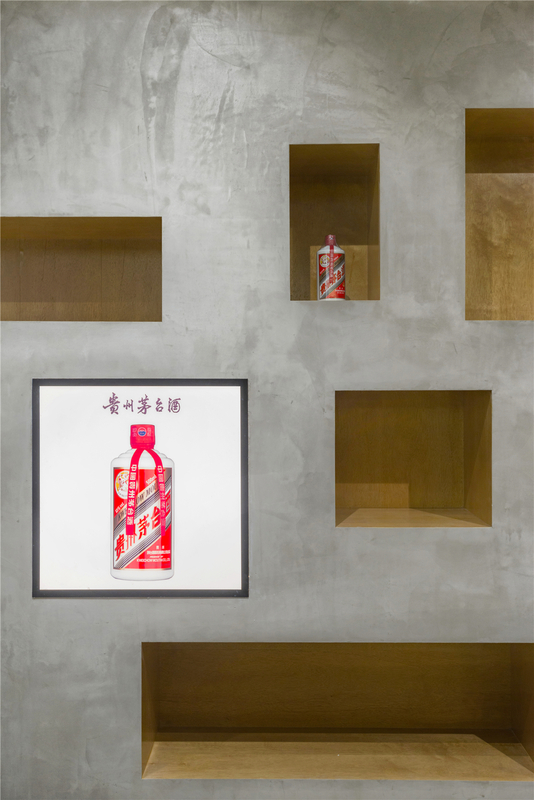 Moutai white spirit that are to be exhibited are more than 100 types and the packaging and sizes of different types are also different with a disordered look. 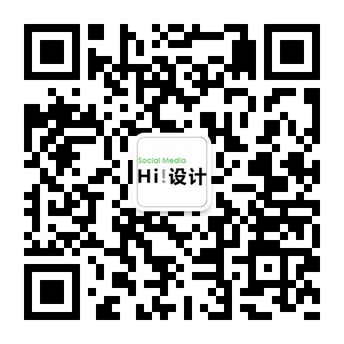 How to unify the space vision under the premise of satisfying the demand of exhibition types is our major concern for the exhibition form, and we have proposed the concept of “concave-convex”. 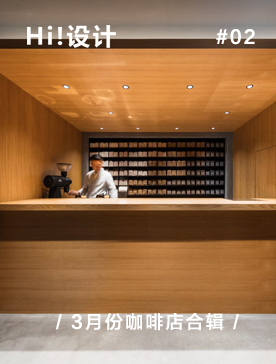 Several square containers of different sizes were designed on the two main exhibition walls on both sides to adapt to Moutai white spirit products of different sizes. One wall is raised “square containers”, and the other is recessed “square caves”. The forms of “concave (recessed) and convex (raised) are visual symbols with a sense of ceremony in traditional Chinese culture, and they are able to form a unified and rich spatial visual language. The floor height of the space is rather high, which enables us to add some stylings to connect the main exhibition walls on both sides. 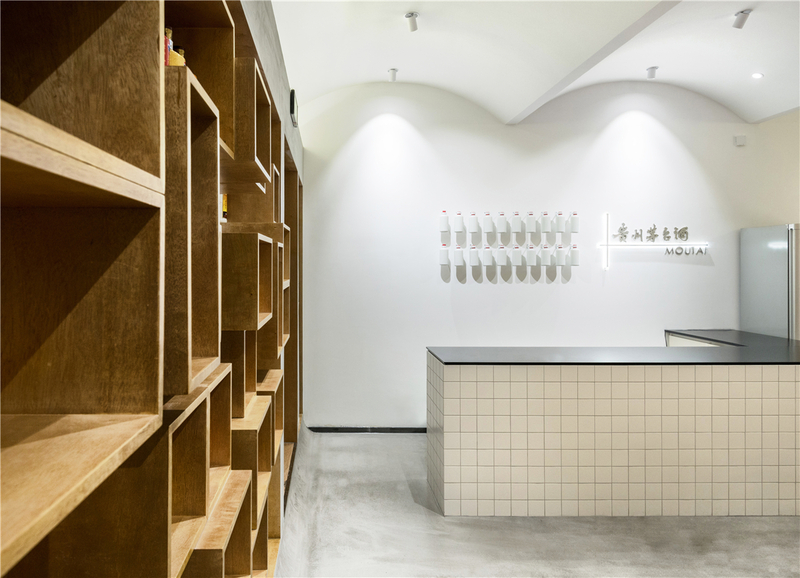 We referred to the space elements of cellar and designed 3 continuous arc suspended ceilings, the light and shadow created by the curved surface softened the atmosphere of the whole space. 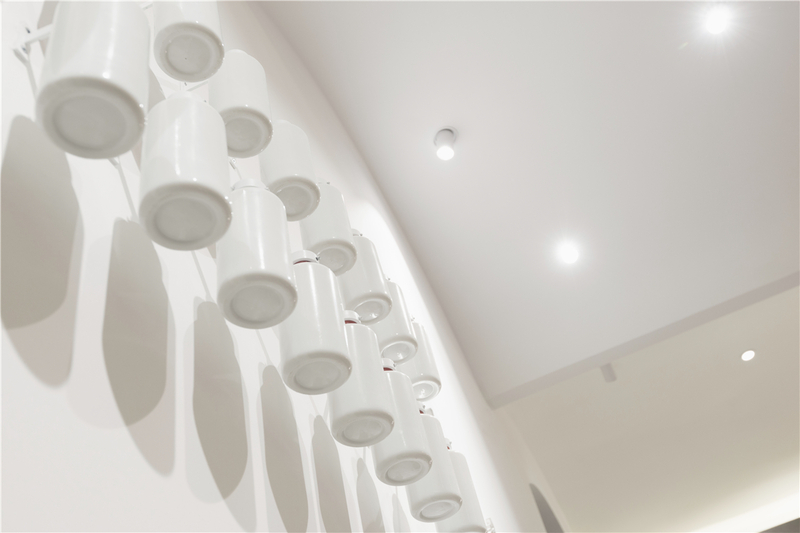 Arc chamfering treatment was made on the surface of cement texture: the corner connecting the wall to go with the ceiling. 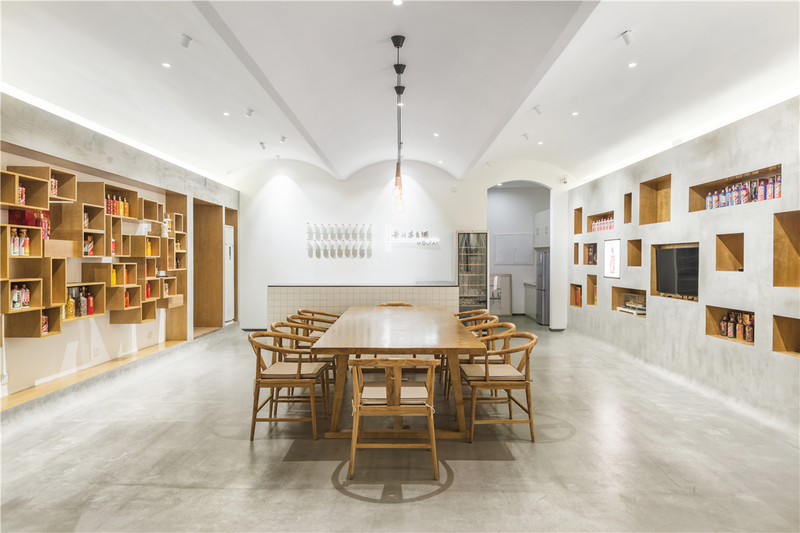 On the whole, 3 spatial dimensions of wall, floor and ceiling constitute an entirety naturally, and tradition and modernity merge together organically. 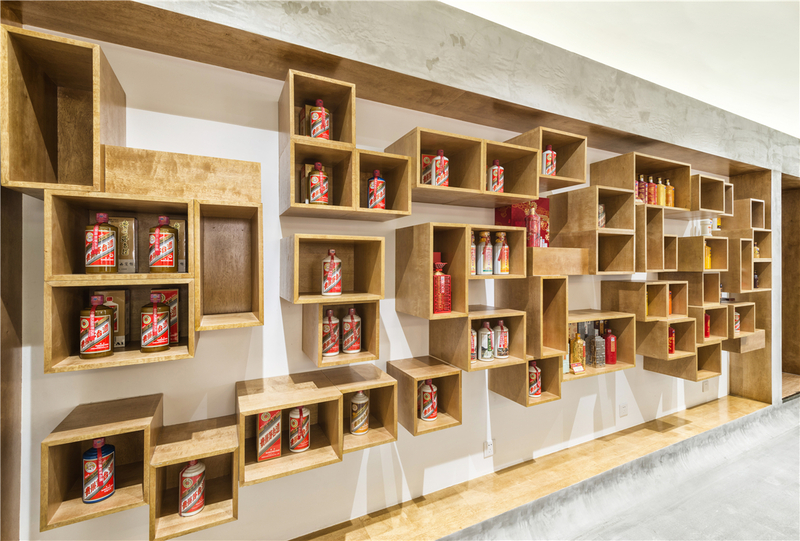 We placed 20 classic white Moutai bottles made of china on the main logo background wall in an array and adorned the space with the articles of the brand to strengthen the brand image in everyone’s mind, and this is the design idea we wanted to achieve via space. 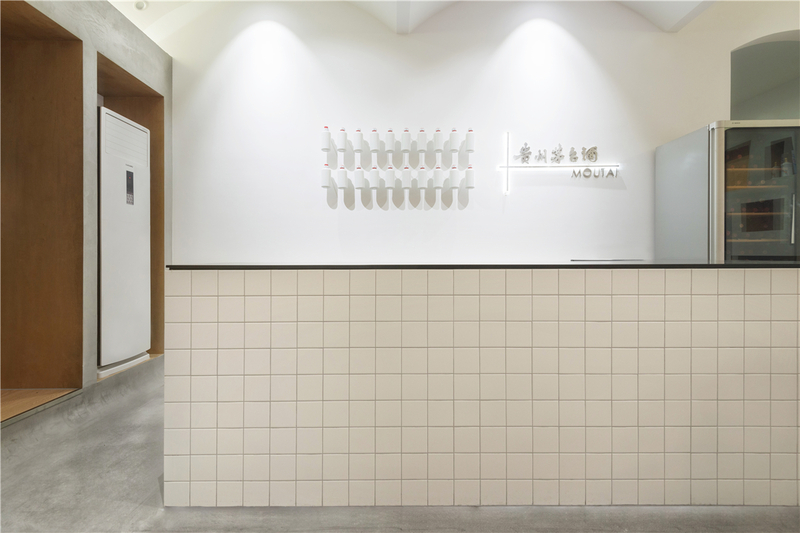 The space is dominated by wood, cement and white latex paint, and the whole style is simple, succinct with variations, which echoes with the brand new and modern idea expressed by the brand of Moutai.